The relative humidity for an indoor environment should remain at most 60 percent; however, 50 or lower is ideal, according to HVAClean. Humidity levels higher than 60 cause mold to grow inside air ducts. Mold growth potentially leads to respiratory problems and allergies. Running a thermostat constantly in the "On" position is hard on cooling units. Freon gas cools the evaporator, but with a consistent flow of air the coils are unable to stay cool. Coils then are unable to dehumidify the air, because the coils cannot reach the dew point. Use your thermostat to control your home's humidity. Adjust the temperature on the thermostat. During the summer the temperature is ideally set between 78 and 80 degrees. According to the Louisiana Department of Natural Resources, every degree the thermostat is raised, an average of 4 to 8 percent is saved on the electric bill. Set the thermostat to "Auto." Using the auto setting on the thermostat lets the evaporator coils cool sufficiently. The air can then be dehumidified and cooled without causing excess strain or warming to the evaporator coils. Buy an inexpensive hygrometer. Hygrometers measure the relative humidity inside a home. Different models can measure both indoor and outdoor relative humidity levels and comfort humidity levels. Observe the humidity in your home with this device. If you notice that your home is cooling but the humidity levels are still high, contact a professional to assess the problem. Use your thermostat's built-in humidity control, if you have it. Some thermostat models have this feature, allowing you to determine your ideal comfort level while saving money on utility bills. 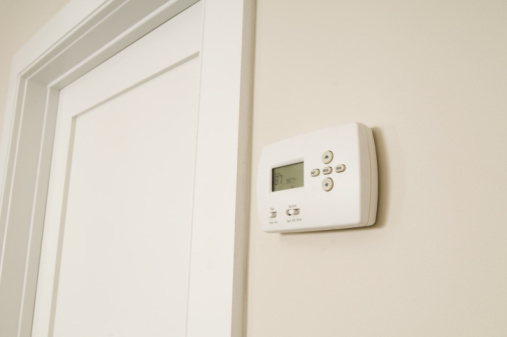 Thermostat styles vary from basic functions like cooling and humidity control only, to high-tech devices that allow you to control the temperature and humidity in your house from a smart phone or remote computer. Your ability to set the humidity control on the thermostat varies by the model and manufacturer; some use buttons to scroll through the menu until you reach the desired humidity level, and with others you can use touch-screen programming to enter your exact preferences.